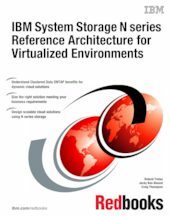 This IBM® Redbooks® publication provides deployment guidelines, workload estimates, and preferred practices for clients who want a proven IBM technology stack for virtualized VMware and Microsoft environments. The result is a Reference Architecture for Virtualized Environments (RAVE) that uses VMware vSphere or Microsoft Hypervisor, IBM System x® or IBM BladeCenter® server, IBM System Networking, and IBM System Storage® N series with Clustered Data ONTAP as a storage foundation. The reference architecture can be used as a foundation to create dynamic cloud solutions and make full use of underlying storage features and functions. This book provides a blueprint that illustrates how clients can create a virtualized infrastructure and storage cloud to help address current and future data storage business requirements. It explores the solutions that IBM offers to create a storage cloud solution addressing client needs. This book also shows how the Reference Architecture for Virtualized Environments and the extensive experience of IBM in cloud computing, services, proven technologies, and products support a Smart Storage Cloud solution that is designed for your storage optimization efforts. This book is for anyone who wants to learn how to successfully deploy a virtualized environment. It is also written for anyone who wants to understand how IBM addresses data storage and compute challenges with IBM System Storage N series solutions with IBM servers and networking solutions. This book is suitable for IT architects, business partners, IBM clients, storage solution integrators, and IBM sales representatives.